For the next three months, Linda Lu will undergo rehabilitation at Emory. A rare complete hand transplant performed by Emory University Hospital surgeons grabbed headlines and attention across the U.S. and the globe. In a first for the Atlanta hospital, the transplant and reconstructive surgeons successfully performed the procedure on 21-year-old Linda Lu, a college student from Orlando. The 19-hour surgery took place March 12 and involved multiple teams of surgeons, anesthesiologists, nurses and operating room support staff. Two teams – one dedicated to the patient – and the other to the donor arm – successfully completed the surgery at approximately midnight. The intricate surgery involved the connection of numerous structures including bones, tendons, nerves, vessels and finally the skin. Lu is now wearing a high-tech brace that supports the limb while she begins the long process to gain function of her new hand. For the next three months, Lu will undergo rehabilitation at Emory. Emory's Hand Transplant Team and its first patient, Linda Lu, at a news conference on March 28, 2011. At the news conference after the successful surgery, Lu said she understands that it will never be a normal hand, but not having a left hand since she was an infant, "I expect it to help in simple everyday activities." She said "right now I am filled with emotions and I don't think that there is really anything that can describe how I feel, other than just happiness, hopefulness and of course thankfulness." Linda Cendales, assistant professor of surgery at the School of Medicine, said, "This is an exciting time for our patient, her family, and the reconstructive community in general. Ms. Lu is doing very well. She is referring to her transplant as ‘my hand'." 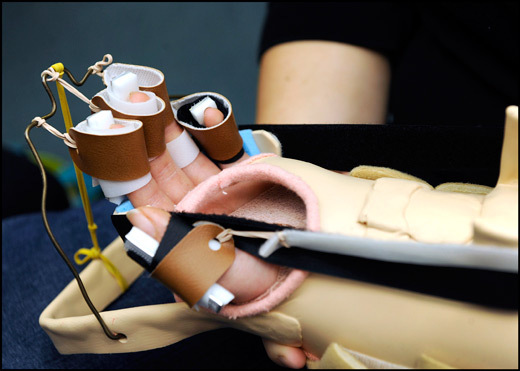 This case is among the small number of hand transplants that have been successfully performed in the U.S. and puts Emory among only four centers to have successfully performed the procedure. It is part of the Emory University-Veterans Affairs Vascularized Composite Allograft Program created in 2007. The program at Emory and the Atlanta Veterans Affairs Medical Center was spurred by a grant from the Department of Defense administered through the Navy Bureau of Medicine and Surgery's Medical Development Program. The first hand transplant in the U.S. took place in Louisville at the center where Cendales trained, and where in 1999, she was on the team that performed the nation's first hand transplant. The Louisville team's first hand transplant is currently the longest surviving hand transplant in the world. Learn more about the Emory Hand Transplant Program.